O.K., world, pin this one on your locker-room wall. 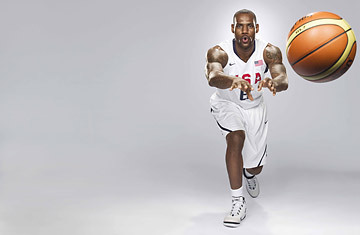 LeBron James is picturing himself on the Beijing medal stand, gold draping his gargantuan chest. "It's going to be like waking up on Christmas Day," says James, the Cleveland Cavalier and global icon who led the NBA in scoring this season. "All you dreamed about this whole month was having that bike you wanted, and you get down to your living room  it's there. It's like one of the greatest things that has ever happened to you." So you're going to bring a hoops title back home to the U.S., the country that gave birth to the game, reared it and then lost the ball to more graceful global neighbors? "Absolutely," James responds. Guarantee it? "Absolutely." Nothing gets the sports world in a tizzy quite like a guarantee. Those who deliver are divine, like Joe Namath; those who fail  and there are too many to mention  get blamed for foolishly firing up the opposition. But is LeBron's promise vintage American vanity? After all, a constellation of the world's best players  the U.S. team features James, Kobe Bryant, Dwyane Wade  should always shine. Over the past six years, however, U.S. teams have gagged, falling to countries like Argentina and Greece; there was even a humiliation by Puerto Rico. And the world's ballers relish a chance to beat the Yanks. Yup, it's LeBron's hubris we hear. Having been to one Olympics, James knows the frenzied forces of national pride that will oppose his team. But hoops is America's gig: the U.S. has won 12 of the 15 Olympic gold medals, excluding the one awarded during the boycotted 1980 Games. James has spent three years prepping for this moment. If this team of supremely gifted, seemingly motivated players loses in Beijing...it will hurt. It should hurt. "For us, it's now or never," says James. "It's the gold, or it's failure." After the Athens embarrassment in '04, when a bickering bunch of Americans sulked their way to third place, the U.S. restructured its hoops hierarchy. One man, former Phoenix Suns owner Jerry Colangelo, now has the power to pick a coach  Duke University's Mike Krzyzewski  and the players. "We didn't respect the Olympic name," says James, a 19-year-old benchwarmer on that '04 team. "We didn't respect what Team U.S.A. meant." Colangelo required players to give up parts of three summers so the team could train for Beijing. In that first year, 2006, the experiment blew up: Greece shocked the U.S. at the world championships. Last summer the team romped through Olympic qualifying; James shot an astonishing 76% from the field and also topped the team in assists. James is the rarest of athletes, a phenom who has actually exceeded the enormous expectations that trailed him out of an Akron, Ohio, high school. He skipped college for the pros in 2003 and guided his hometown team, the Cleveland Cavaliers, to the NBA finals last year. This season he became the youngest player in NBA history to score 10,000 career points. He has earned more than $165 million in salary and endorsements. Only 23, James is now the voice of the U.S. team. "When you watch us play this summer, you're going to be hearing LeBron on the court, yelling and screaming, talking on defense," says Wade. "There's going to be that leadership that we need." On a team filled with All-Stars and Great Wall-size egos, James insists he can still treat Jason Kidd, a 14-year NBA vet, and Bryant, the league's reigning mvp, like green rookies if they screw up. He'll feel free to scream in their face. "I can't play unless I'm that type," he says. "There's no way I can hold back." He's not demure off the court either. "Loud," says Wade when asked to describe James' personality. "Loud," says Bryant. "He talks sunup to sunset," says U.S. forward Carlos Boozer. Kidd is expressing the same sentiment when he stops and glances up. "Hear that?" Kidd says. "See what I mean?" James is marching down a hallway, belting out rap lyrics. While fame seemed to trap Michael Jordan, James clearly loves the life of LeBron. The endorsement loot (Nike, Coca-Cola, Upper Deck) surely helps. But give James credit for staying playful. As the U.S. team filed onto a bus during a New York City promotional tour, James was the only one dancing. When each player was introduced to young, squealing crowds at Rockefeller Center, James was the only guy who ran into the front row, slapping high fives, nearly inciting the 8-year-olds to riot. "I got a lot of kid in me," says James, who, at 6 ft. 8 in. and 240 lb., has always looked, oh, a decade older than he is. James has already had his political baptism by fire. Last spring, Cleveland player Ira Newble asked his teammates to sign an open letter to China protesting the country's interests in Sudan, where the government has sponsored atrocities in the Darfur region. Only James and Damon Jones, a Cav with a shoe deal in China, refused. James took a ton of heat  the Chinese buy sneakers too. But he wanted time to understand these international issues, and he's grown more comfortable speaking out on Darfur. "I'm not going to get up on a panel and sit in front of a board or something like that," he says. "But if I'm asked the question, I will definitely answer it." Right now, the U.S. needs him homed in on the international game, with its wider foul lane and emphasis on spacing, ball movement and outside shooting. So the U.S. roster is built to spread the floor and shoot, with just one true center, Dwight Howard, to bang the boards. Spain, the defending world champions, will feature Los Angeles Lakers standout Pau Gasol and Toronto Raptors point guard José Calderón. If San Antonio Spurs star Manu Ginóbili bounces back from an ankle injury, Argentina, with its beautiful brand of pass-first basketball, could repeat as Olympic champs.